Wreck diving off Antigua, meeting Captain Slate's pet barracuda at Pennekamp underwater park near Key Largo, diving with the sea turtles off Oahu—the nearest I'd been to diving in an aquarium was in Hanauma Bay at Oahu. Ever since I first saw DiveQuest in the Epcot Center over 20 years ago, I knew I had to do it. Oct 1, 2010—today is the day! Weeks ago I called and made my reservation. All that I needed was a swim suit, a photo ID, and my scuba certification. I showed up early at Living Seas (now The Seas with Nemo and Friends) for my 4:15pm session and realized that nobody told me where to meet. I looked around for staff and found someone who didn't know but ran off to find out. After several minutes he returned and gave me directions to go to a lot behind the pavilion. Someone knew I was looking for them and came out of a gate to meet me and bring me to the dive group. I would never have found it on my own. We were taken on a backlot tour of Living Seas. I love it. The guide informed us all about its history, its stats, and its educational and research purposes. It is a functioning marine research facility. We learned about the enormous capacity of the sea water filters (they can filter the entire 5.7 million gallon salt-water tank in 3 hours). 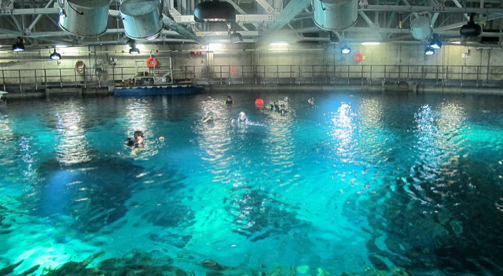 We were taken inside and guided around the various laboratories, sea animal holding tanks, and other facilities, watching scientists and staff going about their business. It is totally fascinating. It is "home to 6,000 inhabitants representing over 60 species—including sea turtles, angelfish, dolphins, rays, sharks and a very special manatee rehabilitation area." We were then directed to the locker rooms where a dive suit and dive bag gift waited for us in an assigned locker. We changed into the dive suits and are then escorted to a lounge for instruction. The lounge has comfortable seating, hot chocolate, and a friendly atmosphere. One of the divemasters appeared and had us review and sign an agreement that we won't sue if we're eaten by a shark. The divemaster presented a video about Living Seas that is actually interesting. We were told that we are going to be part of the Disney World cast and that we are expected to behave. They would, for example, frown upon somebody displaying any...improper...finger gestures in the view of observing children. We were briefed on the rules for the dive and encouraged, as cast members, to interact with the "audience". Everyone is teamed with a dive buddy. There is time before our dive starts so we go out to visit with our families in the public areas. It's all part of the cast show as visitors see people in dive suits anticipating entry into the aquarium, so they stick around to watch the divers. I let my wife know where we'll enter and we decide on a spot where she'll be behind the plexiglass viewing areas to meet so she can get pix. We were escorted up top into a vast chamber above the water (so that's what is up there). 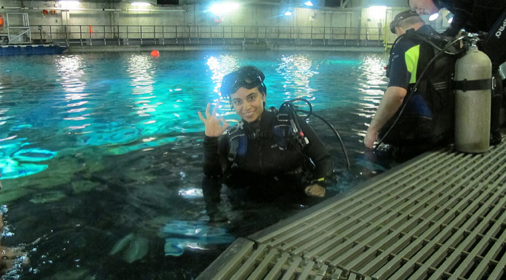 Walking out onto a metal sea deck we line up with our equipment and drop into shallow water where it is convenient to put on the tank. We're guided out to the center of the aquarium and signaled to go down. At that point, we basically have free run of the aquarium. I thoroughly enjoyed diving among the gazillion underwater inhabitants. And many of the fish and other animals seemed to enjoy frollicking with the humans, especially the dophins, sting rays, and big sharks. I glided up to the giant people tube (the tube is giant, not the people) and found my way to my wife who had camera in hand clicking away and taking videos. A special moment. Especially fun was waving at the kids. I glided over to the restaurant which has a big view window by some of the tables. I came in above the top of the window and dropped down upside down to wave at the family at that table. The children were surprised and delighted, waving and laughing. Great fun. This was an amazing experience. I am so glad that I finally had the opportunity. Highly recommended!